Explode out of the start gate with speed and confidence. Rail through corners with total control. Glory delivers proven DH performance, devouring rocks, ruts and drops so you can shave seconds off your time and crank up the fun factor. DH terrain comes at you fast. You need the confidence and control to make split-second decisions and commit to your lines. 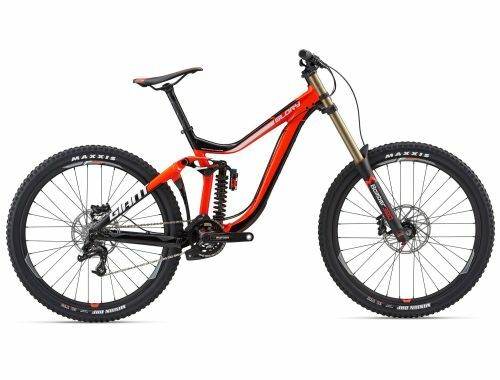 With 203mm of fully active Maestro Suspension featuring a trunnion-mount shock, the Glory 27.5 has been tested and proven by some of the top DH racers and gravity riders in the world. Its lightweight, super-strong frame is engineered with geometry that’s optimized for its 27.5 wheels, plus a super stiff OverDrive steerer tube for unwavering control and steering precision. The 63-degree headtube angle and longer wheelbase was developed and refined with riders from the Giant Factory Off-Road Team to excel on the steepest, most extreme DH tracks in the world. ALUXX SL aluminum frameset is hand-built in-house by the world leader in alloy bicycle technology. Refined and perfected over the past decade, the latest iteration is long and low (63-degree head angle), stiff and light.